Love travel? Enjoy wine? 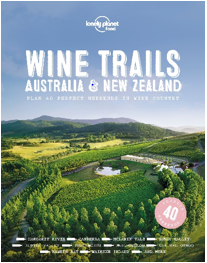 Welcome to Lonely Planet’s Wine Trails: Australia & New Zealand, published this month. This comprehensive companion to 40 weekends of wine-tasting across Australia and New Zealand is the follow-up to Lonely Planet’s best-selling 2015 book, Wine Trails. Meet the regions’ best winemakers, and discover each place, its people and their traditions through the wine that’s made there. Wine Trails: Australia & New Zealand also contains maps, practical details and weekend-long itineraries for each region, where to stay and eat, and - of course - what to drink. Lonely Planet Food – an imprint of the world’s leading travel authority, Lonely Planet – was established in 2016 to enable travellers (both on and off the road) to discover the most local, authentic and delicious foodie hotspots around the world. Lonely Planet believes food and drink are an intrinsic part of travel, so now we’re sharing our foodie knowledge with titles that serve up unforgettable, mouth-watering food and drink experiences across the globe. Explore the culture behind local cuisines, where to find them and how to enjoy them. Find out more on https://www.lonelyplanet.com/food-and-drink/, and join us on Instagram (Instagram.com/lonelyplanetfood).